There have been a number of dramas exposing the abuse of “fallen” young women in the Magdalen Asylums of Ireland, such as the film The Magdelene Sisters or the play Eclipsed by Patricia Burke Brogan that Wilde Irish did at Berkeley City Club in 2004. Monica Byrne’s new play What Every Girl Should Know takes place in a variant of that setting—this time it’s a Catholic reformatory in New York City circa 1914—but everything about it suggests that this is a very bad place where nothing good could possibly happen. Abigail Edber, Arisa Bega, and Carlye Pollack in What Every Girl Should Know. Photo by Cheshire Isaacs. That sense of a depressing, cell-like atmosphere is accentuated in Anne Kendall’s simple set for Impact Theatre’s production (which is also the North Carolina playwright’s Bay Area debut). Identical, spartan single beds are laid out with shelves above holding only bibles, icons, head coverings and rosaries. The walls are dingy, the blankets a drab tan, and everything seems designed to make the residents hate life. Abra Berman’s costumes are prim and period-appropriate, with slightly different bedclothes the only outlet for sartorial self-expression. But it takes more than that crush the human spirit. The first time we see the teenage girls who live there, they’re practicing masturbation under the covers as a kind of group activity, comparing notes and recording the results in a well-hidden logbook. From the way they tell it, they don’t have it all that bad. Sure, their days are made up of prayers, confession, radiation treatments and doing people’s laundry, but the priest there sounds pretty understanding even if the nuns don’t. Still, it’s a relief to check the program and find that we won’t actually be seeing any of these authority figures intrude into this room, because no good could possibly come of that. Still, it’s best not to get too comfortable, because it’s neither a good place nor a good time for women and girls. Even distributing information about contraception was illegal, and one of the girls, a new arrival, has smuggled contraband family planning pamphlets into the facility. Soon the four roommates have taken on future Planned Parenthood founder Margaret Sanger as their secret patron saint, offering her sacrifices (including the dark secrets that brought them there) and directing their prayers to her. These rituals become combined with elaborate revenge fantasies against those who’d wronged them, until the line between what’s real life and what’s in their heads is completely blurred. Impact’s cast does a great job of infusing the characters with enough zest to fill the bleak surroundings with life. Arisa Bega exudes wide-eyed naïveté as Lucy, who clings tenaciously to girlish fantasies. 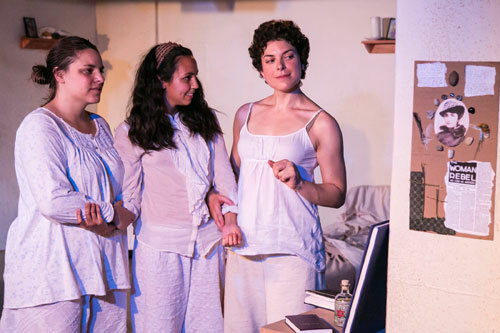 Carlye Pollack’s Theresa has an impish air of sly amusement and joie de vivre, but there’s a harder edge to Abigail Edber’s Anne, her playfulness barbed with mockery. Elissa Beth Stebbins is serious and severe as new arrival Joan (replacing a dead roommate also named Joan), her patience strained by her bunkmates from the moment she arrives. Director Tracy Ward’s staging is lively if sometimes confusing. When the girls start having a sort of mystical experience, they’re tossed around in Erika Chong Shuch’s choreography as if by a natural disaster or demonic possession, so it’s perplexing (a) what exactly is supposed to be happening and (b) how on earth they consider it a positive thing to be sought out again. That’s one of the things that’s unclear in the play in general—what the seemingly supernatural occurrences are supposed to be or signify. Byrne and the cast and creative team do a good job of making us care about the characters. The dialogue is entertaining if anachronistically modern, with only an occasional antiquated-sounding line to remind us it’s in period. Particularly interesting is that the girls seem to think nothing of breaking that commandment about taking the Lord’s name in vain, without even the thrill of the taboo, unlike most of the other stuff they do to pass the time. Despite some bits that come off as predictable or confusing, it’s a funny play and a sobering one that highlights both how far society has come and how it seems hardly to have changed at all. The fact that politicians are still debating whether women should have easy access to birth control (or at least whether insurance policies should be required to provide it) suggests that an altar to the patron saint of family planning might still not be that bad of an idea. Show #99 of 2013, attended September 7. Sounds fascinating, thank you for reviewing. I wish I’d known about this earlier so that I could have seen it myself.